Can a conference on Marxism be anything more than a brillante exposición de modas, a dazzling but transient display of seasonal academic fashion, a show that panders to an older generation’s political nostalgia and feeds the retro tastes of the young? Can it yield anything other, anything more, than the routine reproduction of bourgeois academic careers and an aftertaste (when one is finally on one’s own again and waiting, say, for a connecting flight to Cape Town in that seemingly unassailable fortress that is Atlanta’s international airport) of political disillusionment? The ironies and many contradictions of academic careers and transnational conference tourism notwithstanding, I can’t but insist that Marxism is indeed more than mere retro intellectual fashion; that Marx, and the riches of the Marxist tradition, is still better positioned than any other body of thought to help us make sense of and imagine life beyond the pervasiveness and crises of contemporary global capitalism. If ever there was a time to return to Marx – not just to invoke his name rhetorically but to reread and reactivate him – then certainly that time is now. In the words of Slavoj Žižek, commenting on the recent protests, social upheavals and (more or less) revolutionary energies everywhere from Egypt to Wall Street, this is indeed “a year for dreaming dangerously” (Žižek, 2012). Marxism, yes; but psychology? Marxism and psychology? In another great song, Playa Girón, Silvio Rodríguez calls for a celebration of ordinary revolutionary heroes; of the brave Cubans who defeated US imperial aggression at the Bay of Pigs. He calls on his compañeros the poets, the musicians, and the historians; but not the psychologists… How does one dream dangerously in psychology? With great difficulty, it would seem. Even at this conference, which was explicitly aimed at advancing dialogue between Marxism and psychology, dangerous ideas were in rather short supply. Despite all the Marxism, there was not much revolution in the air. There were a number of very interesting panel discussions on contemporary political issues, ranging from the global financial crisis to the more local struggles of various Mexican social movements, but the majority of papers (my own included) dutifully engaged Marxism as an academic, rather than a revolutionary tradition: as a meta-theoretical vantage point from where to critique aspects of mainstream psychology; as a diagnostic system for thinking critically about social and political issues; and as a resource for various kinds of textual analysis. Marxism, in other words, as used to interpret rather than change the world. And perhaps it is almost inevitable, considering the often alienated nature of academic activity in general and the conservative nature of psychology in particular, that we should spend more time thinking about how to change psychology than we do thinking about how to change the world. Marxists in psychology are faced with a double task. They have to critique the present and imagine the future as Marxists and as psychologists. This raises the question: what kind of psychology is required? There are no easy answers to this question, but “psychology” was perhaps too narrowly defined (and interrogated) at this conference. The majority of the keynotes and paper presentations were psychoanalytic in orientation — and Lacanian to be more specific. There is indeed a long and significant history of dialogue between Marxism and (not only Lacanian!) psychoanalysis, but it is not the only dialogue between Marxism and “psychology” we should be paying attention to. What about the so-called Cultural Historical Psychology? What about German Critical Psychology? These were not well represented at this conference. More significantly even, considering the conference was held in Latin America, was the relative absence of locally honed traditions of critical and revolutionary psychology, such as Liberation Psychology. I travelled to Mexico hoping to encounter a greater variety of psychological languages and vocabularies, and a richer presence of vernacularized psychologies. But I am beginning to sound too negative. This was in many ways a worthwhile, even fascinating conference. I listened to many excellent presentations and participated in many wonderful conversations. Despite the occasional administrative and organisational hiccups, our hosts from the Faculty of Psychology at the University of Michoacán were nothing but warm and welcoming. One of the things that stood out and made this conference truly remarkable was the large number of students who attended, seemingly of their own volition. There were literally hundreds of students who came to listen to papers, who asked excellent, theoretically sophisticated questions, and who stayed the course until the very end, late on a Saturday evening. This is a testimony to the students but also the quality of the academic environment — and perhaps it means the future of Marxism in psychology, and critical psychology more generally, lies in Latin America. Also noteworthy is the issue of language and translation. English was not a lingua franca at this conference. The majority of papers were presented in Spanish; quite a lot of them without the option of translation for non-Spanish speakers. I found this refreshing and politically important: the global hegemony of English (especially in academic spheres) is such that we easily forget this language (like capitalism!) also has limits; that it is not the air that all of us breathe. I think it is vitally important for academics that are from parts of the world where English is not just dominant but almost rendered invisible by its self-evident position as lingua franca to experience the feeling of not being able to understand; of being part of a linguistic minority. It can, of course, also be very frustrating. If one does not think very carefully and creatively about facilitating understanding, important opportunities for dialogue are missed and delegates easily default into language blocs. At this conference I sometimes found myself, rather despondently, trapped in sessions where not a word of English was spoken, not able to understand anything. At other times I found myself amazed at how successfully linguistic obstacles can be negotiated. One such instance was my own presentation. The translator disappeared just before discussion time, but questions and answers were collaboratively, and seemingly successfully, translated by a whole audience striving to create meaning together. 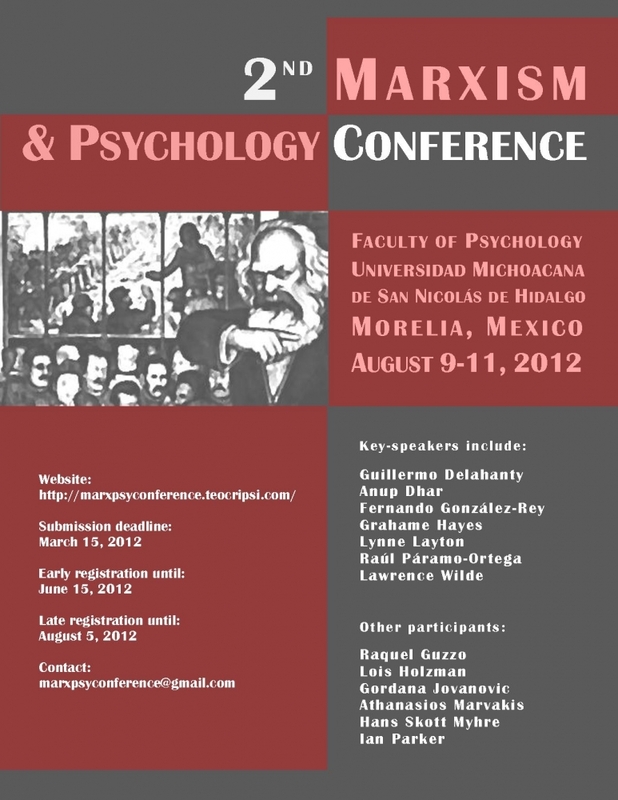 Will there be a Third Marxism and Psychology Conference? There was some serious debate about this, and it remains unclear. One the hand, some delegates felt we should not allow these conferences to slip too easily into the rut of biennial repetition, making it simply another academic institution that routinely reproduces itself. On the other hand, other delegates felt that since serious reflection on Marxism in psychology is so rare, it might make sense to institutionalise the conferences somewhat; to at least make sure the space for this important reflection does not altogether disappear. We shall wait and see. This entry was posted in Uncategorized and tagged Marxism and Psychology, Second Marxism & Psychology Conference. Bookmark the permalink.